Although many restaurants and caterers focus on the initial cost of a grease trap when deciding whether one is needed and which to purchase, this is often a mistaken approach to take. While the upfront cost of a grease trap may be offputting to many smaller venues, or even larger chains with multiple sites requiring grease removal equipment installed, fitting a grease trap is actually a money saving commitment. It may seem counter-intuitive at first glance to think that by purchasing a grease trap, and paying to have it regularly serviced, you will actually end up saving money, but once you understand the role a grease trap plays in the kitchen and the impact a properly maintained trap can have, the benefits should become fairly apparent. A kitchen, or under-sink grease trap is sized, based on the volume of water expected to flow through the machine. Units taking the outflow from a variety of kitchen appliances will tend to be larger than ones dealing with just a single sink, although a number of other factors are also taken into consideration e.g. the type & volume of food waste flowing into the machine, the preparation method, and whether any detergents will also feed into the trap. Ensuring your grease trap is correctly sized is of vital importance, when purchasing one for your site. While an oversized trap will cost you more to install and service, an undersized trap will be unable to function effectively, and will lead to a risk of overflows and blockages, as the volume of greasey waste water overwhelms the trap, and escapes into the drainline and potentially onto your kitchen floors. This in turn creates health hazards, and the risk of pest infestations, blocked pipework, fines and even prosecution, or site closures if the issue isn’t dealt with promptly. Even with a correctly sized grease trap, if the unit is not regularly maintained, to ensure it remains in full working order, then the same issues as those stated above can arise. If the trap is allowed to fill to capacity, it will cease to function at all, with greasey water no longer being collected in the trap and simply passing through to the drainline. For owners of automatic traps, failure to adhere to daily maintenance procedures can lead to similar results, with food collection baskets becoming full, or the perforations blocked, and wiper blades and skimming wheels becoming clogged with grease, preventing them from skimming the waste FOG into a container for collection. Provided the processes listed above are adhered to, your grease trap should help to eliminate virtually 100% of fat, oil and grease from going to drain, which creates often substantial savings on CCTV’s, jetting and other pricey drainage work required to clear blockages once they materialise. As drainage issues are all too often extremely urgent, and will happen very frequently for sites without any grease removal equipment, ensuring the unit is serviced by a professional on a regular basis will reduce the need for last minute call outs and site closures when pipework begins to leak, or sinks begin to back up. And that’s before looking at the risks and costs of fines and site closures, which can be levied by shopping centres, airports, or water authorities. When comparing manual and automatic grease traps, although the initial cost for a manual grease trap is cheaper than that of an automatic trap, the requirement of far more frequent servicing, or alternatively the need to buy a bio dosing unit and restock fluid several times each year actually makes this a more expensive option in the long run. On the plus side, these units typically do not require much to be done in the way of daily maintenance, compared to automatic grease traps, which require strainer baskets to be washed and emptied, skimming wheels and wiper blades to be wiped down, and oil collection containers to be emptied into a securely sealed container for collection & disposal/recycling under license. 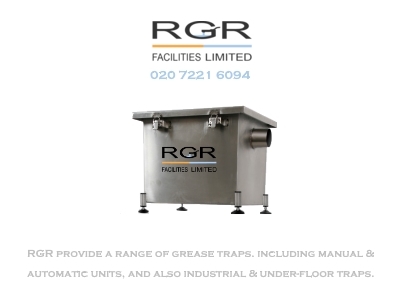 If your commercial kitchen is in need of a grease trap, get in contact with RGR today, either by giving us a call on 020 7221 6094, or by emailing info@rgrfacilities.co.uk and we can carry out a cost and commitment free site survey to determine a bespoke grease removal regime for your site.